NATURAL CHIMES (#12191) by Jan Schrader provides you with 10 patterns to create your own fused glass wind chimes for your home and gardens. Designs include fish, sunsets, flowers, frogs, a butterfly and more. Detailed instructions and full color photos of each design along with helpful hints are included. 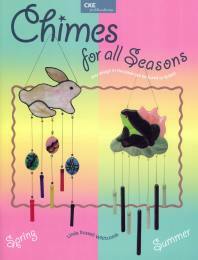 CHIMES FOR ALL SEASONS (#12193) by Linda Russell Whitcomb has 16 patterns for wind chimes that can be done by fusing or foiling. Complete, illustrated instructions are given for both methods. All of the patterns are given to you full size, so no extra design work is needed. Full color photos will help you with color selection. There are patterns for every season from jack o' lanterns to Santa's sleigh to St. Patty's shamrocks.